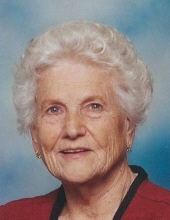 Doris Virginia (Wiser) Crimmins passed away on March 18, 2019. She was born in Palmer, Nebraska on May 14, 1928 to Raymond and Grace (Sinsel) Wiser. She grew up on a farm near the small town of Archer, Nebraska, and moved to Oregon in September of 1940. She graduated from Dayton High School in 1945. Doris married Orval Crimmins on June 20, 1948. They had two children; Duane Crimmins of McMinnville, Oregon, and Sharon Nail of Colton, Oregon. Doris worked for L.A. Courtemanche Company from 1945 to 1958, when they ceased business in the area. She went on to work for Wideman Equipment Company for the next two years. After that, she began at the Ford Dealership- Gilbert Tilbury Co., later doing business as Chuck Colvin Auto. She was there for 30 years, until she retired in 1990. She then worked for O.C. Yocom Laundry as a bookkeeper on a part time basis for two years. After retiring, Doris delighted in volunteer work in the area of horticulture through the Master Gardener Program and OSU Extension Service. She loved gardening and working in the demo gardens. She had a greenhouse at home and enjoyed seeding and growing plants for the Master Gardener annual sale. Doris also served on the Yamhill County Extension Advisory board; and was President of Yamhill County Master Gardeners for two years; while also continuing her volunteer work. In additions, she served as the Superintendent of the Floral Division of the Yamhill County Fair for 5 years, beginning in 1992. In 2008, she worked with the Carlton Elementary School Children’s Gardening Project as a Master Gardener. She enjoyed working with people and keeping active with various projects, and also volunteered in the SMART reading program at Wascher Elementary School in Lafayette for 12 years. Doris was preceded in death by her husband, Orval; parents; Raymond and Grace Wiser; brothers, Jack Wiser, Allen Wiser, and Rodney Wiser; and sisters; Joyce Jackson, Jean Callahan, and Vivian Wiser. She is survived by daughter Sharon Nail of Colton, Oregon; son Duane Crimmins (Molly) of McMinnville, Oregon; six grandchildren and four great-grandchildren. As per Doris’ request, no services will be held. Contributions may be made to Shriner’s Children’s Hospital, Master Gardner’s Program of Yamhill County, or a charity of your choice. To send flowers or a remembrance gift to the family of Doris Virginia (Wiser) Crimmins, please visit our Tribute Store. "Email Address" would like to share the life celebration of Doris Virginia (Wiser) Crimmins. Click on the "link" to go to share a favorite memory or leave a condolence message for the family.